This Atlas invites the reader to tour the farthest reaches of the rainforest in search of exotic--poetic--plant life. Guided in these botanical encounters by Francis Hall , who has spent forty years in pursuit of the strange and beautiful plant specimens of the rainforest, the reader discovers a plant with just one solitary, monumental leaf; an invasive hyacinth; a tree that walks; a parasitic laurel; and a dancing vine. Further explorations reveal the Rafflesia arnoldii, the biggest flower in the world, with a crown of stamens and pistils the color of rotten meat that exude the stench of garbage in the summer sun; underground trees with leaves that form a carpet on the ground above them; and the biggest tree in Africa, which can reach seventy meters (more tha 200 feet) in height, with a four-meter (about 13 feet) diameter. Hall 's drawings, many in color, provide a witty accompaniment. Like any good tour guide, Hall tells stories to illustrate his facts. Readers learn about, among other things, Queen Victoria's rubber tree; legends of the moabi tree (for example, that powder from the bark confers invisibility); a flower that absorbs energy from a tree; plants that imitate other plants; a tree that rains; and a fern that clones itself. Hall 's drawings represent an investment in time that returns a dividend of wonder more satisfying than the ephemeral thrill afforded by the photograph. 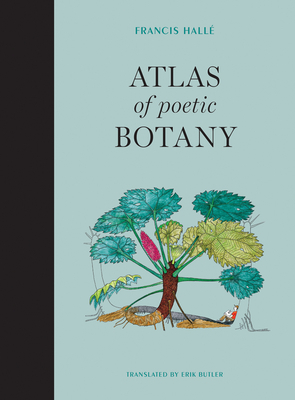 The Atlas of Poetic Botany allows us to be amazed by forms of life that seem as strange as visitors from another planet.